Do your children like to ask questions? Are the students in your school curious? 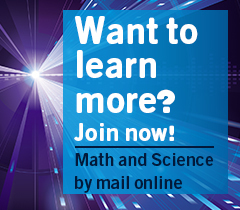 Math and Science-by-Mail brings Weizmann Institute scientists and mathematicians to you! Dr. Bessie Lawrence International Summer Science Institute - registration for 2016 is closed! A science discussion in a cafe atmosphere. The discussions are held outside of the Davidson Institute of Science Education. The public is invited to join (but best to call before you arrive).